German Chancellor Angela Merkel announced the provisional shut-down for three months of seven ageing nuclear reactors pending a safety review in light of events in Japan. Germany announced Tuesday the temporary shutdown of the oldest seven of its 17 nuclear reactors pending a safety review in light of Japan's atomic emergency. "We are launching a safety review of all nuclear reactors ... with all reactors in operation since the end of 1980 set to be idled for the period of the (three-month) moratorium," Chancellor Angela Merkel said. This covers seven nuclear reactors in Germany, which decided a decade ago to be nuclear-free by 2020, a target postponed until the mid-2030s by Merkel's government late last year -- despite strong public opposition. Japan's government has said radiation levels near the Fukushima nuclear plant have reached levels harmful to humans, advising thousands of people to stay indoors after two explosions and a fire at the facility Tuesday. 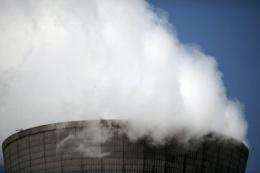 Four of the six reactors at the plant, 250 kilometres (155 miles) northeast of Tokyo, have now overheated and sparked explosions since Friday's massive earthquake and tsunami knocked out cooling systems. "After this moratorium, which will run until June 15... we will know how to proceed," Merkel said following crisis talks in Berlin with premiers of German states where there are nuclear plants. She said Berlin would also use the period to discuss what to do with radioactive waste -- no permanent storage site exists -- boosting renewable energies, and international safety standards for nuclear power. "Safety standards in Germany are one thing, they are important, but safety standards in Europe, being able to compare then, and international safety standards are also important," Merkel said. Germany's older plants include one in Bavaria, two near Frankfurt and two in the southwestern state of Baden-Wuerttemberg -- where a key state election takes place on March 27, with nuclear power set to be a major issue. A survey by public broadcaster ARD published on Tuesday had 53 percent of respondents saying all reactors -- which produce a quarter of Germany's power -- should be taken out of service as soon as possible. Seventy percent thought that an accident similar to that in Japan could happen in Germany, and 80 percent want Merkel to reverse the government's extension of operating times, the poll of 909 voters showed. Germans have long been uneasy about the safety of nuclear power, with shipments of nuclear waste regularly attracting angry protests and Merkel's decision sparking large-scale demonstrations last year. On Monday large numbers of people worried about nuclear safety -- more than 100,000 according to organisers -- took to the streets nationwide. On Saturday people formed a 45-kilometre human chain between a nuclear plant and the Baden-Wuerttemberg state capital Stuttgart. Merkel says that the extension is necessary because green technologies like solar and wind power are not yet ready to fill the gap left by abandoning atomic energy. But opponents accuse her of being motivated more by extra profits for energy firms -- whose shares fell sharply on Tuesday for the second straight day -- rather than concern for the environment.